Can Russia be European and Asian? After centuries of East vs. West argument, Russia chooses both. Polyarniy Ural, the northernmost Europe-Asia border marker. In 1868, a chapter of the Russian Geographical Society opened in Orenburg, a Russian steppe town about 1,000 miles east of Moscow. Speaking at the opening ceremony, Orenburg’s governor, Gen. Nikolay Kryzhanovskiy, called on the geographers to support European Russia’s civilizing mission in what he called “wild Asia.” But to do that, they needed to determine exactly where that “wild Asia” began. Today, Orenburg retains a European feel. Its pleasant downtown is like a little open-air museum of the days when it was an important colonial center rather than the out-of-the-way, midsized city it is today. There’s a miniature reconstruction of a 18th-century gate bestowed on the city by Empress Elizaveta—representing Orenburg’s role as the gateway to the East—and next to it, the handsome, yellow residence where Kryzhanovskiy and other governors managed the business of empire. Orenburg also still considers itself the border between Europe and Asia, but less in the sense of the frontier of civilization and more as a small-town tourism branding effort. A grand footbridge, complete with a continental border marker in the center, connects the European center with a park and beach on the Asian side. Or, for about 75 cents, you can take a cable car with “Europe-Asia” painted on the side. 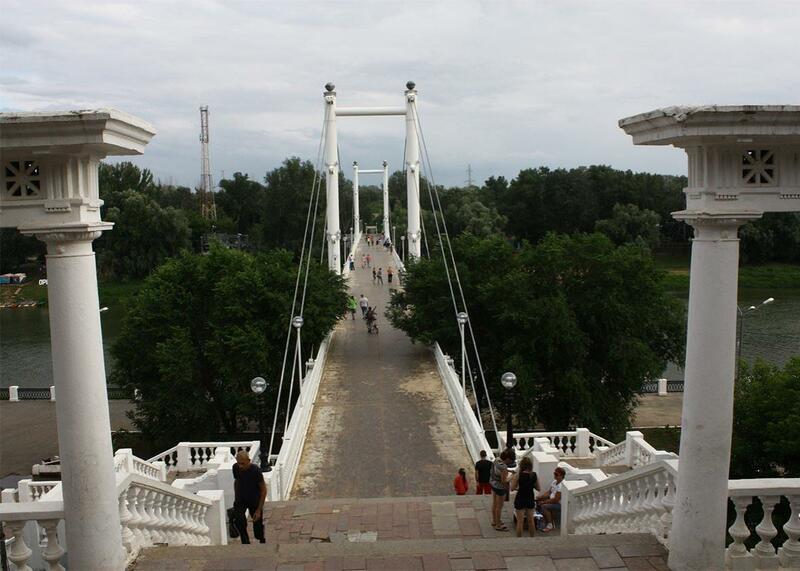 A bridge over the Ural River that’s considered the border between Europe and Asia here. But the dramatic divide between Europe and Asia that Gen. Kryzhanovskiy described does not exist. Russia has become a sort of melting pot, and the descendants of those “wild Asians,” like Kazakhs and Bashkirs and Tatars, stroll along Orenburg’s footbridge along with ethnic Russians, with little to distinguish them but their facial features. And yet, geographers in Orenburg are again today revisiting the question of the border between Europe and Asia, trying once and for all to settle the question of where it really lies. This may seem like an anachronistic undertaking in the 21st century, when it’s widely understood—by academic geographers more than anyone—that Europe and Asia have no natural, geographical meaning. Alexander Chibilev, the current head of Orenburg’s geographical society and the leader of the border-redrawing effort, will be the first to tell you that the idea of a strict divide between Europe and Asia is arbitrary. I meet him in his office in one of Orenburg’s grand, crumbling mansions, on a street as much pothole as pavement. Chibilev was the one who gave me the text of Kryzhanovskiy’s speech about “wild Asia,” which he’d found in the society’s archives, and laughs as he recalls some of its more lurid passages. But he argues that as long as the concepts of Europe and Asia persist, it behooves us to at least come up with a common understanding, even if it’s ultimately arbitrary, of what those terms mean geographically. Geography is serious business in Russia. Russian President Vladimir Putin, in addition to his other duties, also happens to be the chairman of the board of the Russian Geographical Society. (Defense Minister Sergey Shoigu is the president of the society.) An Azerbaijani geographer working with Chibilev excitedly told me that Putin has been “personally briefed” on the Europe-Asia border project. Chibilev himself is more modest, and says only that Putin was in the audience during a conference at which he presented the Europe-Asia border project but noted that the president didn’t evince any obvious signs of interest. Chibilev tries to play down the government’s role and insists that his work is apolitical. His justification for where the border should lie is based on geology and river flows. But he acknowledges the tension. “Unfortunately all this is the legacy of politics and geopolitics,” he says. Politics and geopolitics have in fact been closely connected with every Russian effort to define the border between Europe and Asia. “Europe” in Russia means much more than just the western part of the country: It’s also the civilization against which Russia defines itself. Europe’s place in Russian identity is exceedingly complex and contains elements of insecurity, arrogance, admiration, and emulation. And these attitudes have been reflected in Russia’s efforts throughout the centuries to determine where the continent’s geographical borders lie. When the ancient Greeks first defined the borders of Europe, its eastern edge was set at the Don River. But the ancients didn’t know enough about the Don to realize that it peters out well before the Arctic Ocean and so is not much of a continental divide. For centuries, that obvious flaw didn’t matter to Russians but, as geographer and historian Mark Bassin has documented, it began to become an issue during the rule of Peter the Great, who wanted Russia to become a European country. By this time, Europe had come to signify more than just a part of the globe (as it was to the Greeks) but a civilization: Christian, enlightened, and modern. But it was still a part of the globe, too, and Russians started to see the fact that Europe didn’t have a proper border as a problem for them. As the gateway of Asiatic commerce, and the capital of a distinct territory (a fact emphasised by the official division of the empire into Russia, Siberia, Turkestan, and the Orenburg district), Orenburg has a right to some appearance of wealth and civilisation; but, nevertheless, the first sight of it is always more or less of a surprise. The untravelled Western, to whom any part of the Asiatic frontier is on a par with Patagonia or the source of the Niger, would be somewhat bewildered at finding, in the very heart of the Eastern prairie, trim public gardens, and massive Government buildings, and well-paved streets thronged by fashionably-dressed loungers, and Tauchnitz editions of “Middlemarch” or “Poor Miss Finch” ranged behind irreproachable plate-glass. … This is the threshold of the world, and beyond it lies our plunge into the unknown. The best solution to this problem of a division between Europe and Asia would seem to be in discarding as outmoded the division of Eurasia into two very unequal parts along arbitrary and questionable lines, but rather to divide it into several sub-continents without violating the integrity of the Soviet Union. Europe then becomes indisputably that part of the continent to the west of the U.S.S.R. This interpretation is realistic in that it accords with what thinking people today mean by Europe, and it closely coincides with the historical and essentially geographical Europe. Today, Russia is again grappling with its status vis-à-vis “civilized” Europe, with issues as varied as the annexation of Crimea, Olympic doping, and gay rights taking on an East vs. West cast. And so it is perhaps unsurprising that Russians are again raising the question of the geographical border between Europe and Asia. The en vogue way to talk about Russia’s otherness today is with the concept of “Eurasia,” the idea that Russia and its former satellites are neither Europe nor Asia, something in between yet unique. Eurasia’s borders are never made explicit, but they often seem to coincide with those of the former Soviet Union. Putin has an obvious sympathy for Eurasianist ideas. He has portrayed Europe as a place of moral rot and degradation and has tried (mostly unsuccessfully) to set up a “Eurasian Union” that would not just be an economic bloc like the EU but represent, in some fashion, Eurasian values. “The Eurasian Union is a project for maintaining the identity of nations in the historical Eurasian space … a chance for the entire post-Soviet space to become an independent center for global development, rather than remaining on the outskirts of Europe and Asia,” he said in a 2013 speech. The old Europe-Asia border monument in Ekaterinburg, Russia. 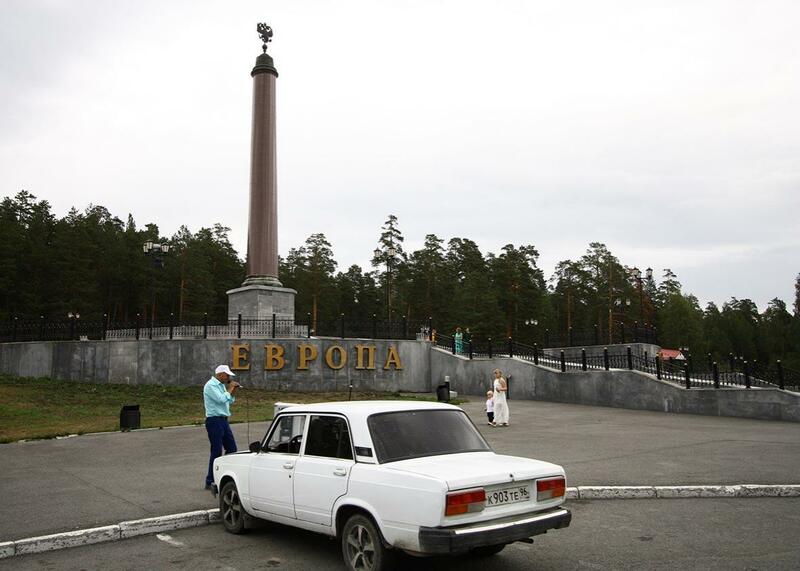 Thus far none of this has been built, and now the site consists only of a roadside café and a small granite monument with a stripe down the middle and the words “Evropa” and “Aziya” on either side. Kolegov brings tour groups (usually taking a stopover on the trans-Siberian railroad) here and one day lets me tag along with a tour group of elderly Germans. 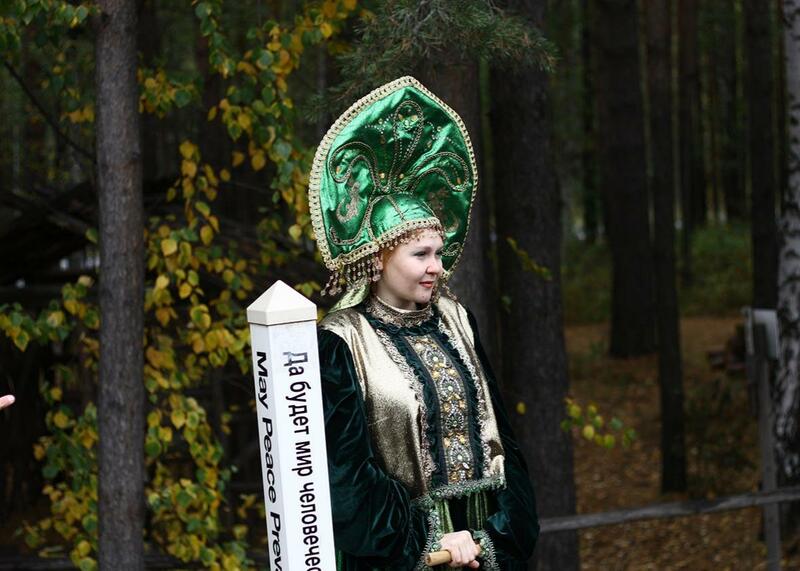 We drive up into the Urals (a barely noticeable slope) to the border site and are greeted by the “hostess of the mountains” (Kolegov’s daughter), dressed in a green Slavic fairy-queen dress and headdress, her character based on that of a local 19th-century writer’s folk tales. “Welcome to the friendliest border in the world,” she says, offering the Germans the traditional Russian greeting of bread and salt. “The hostess of the mountains” at Ekaterinburg’s Europe-Asia border. Perhaps to make up for the fact that the border itself is so nondescript, Kolegov’s team has set up a whole gamut of activities for the tourists. We visit a rock donated by a Mongolian delegation that, the hostess tells us, represents Russian character: “rough and rude on the outside, but with a heart like a diamond inside.” The Germans hammer in a signpost showing the distance to their town on a post that already has several other such signs nailed in, from South Korea, Italy, and elsewhere in Europe and Asia. We are told that it is a “tradition” to square dance around the monument to piped-in Russian pop. Group photos, naturally, are taken at every stage of this. It’s all very corny and puts me in a bit of a sour mood. I had set out two months before, in Istanbul, setting myself the ambitious task of writing a sort of anti-travelogue about a trip along a meaningless border. I was now close to the end of that trip and had found more or less what I’d expected to find on the border: a whole lot of nothingness, punctuated by the odd tourist trap. But here, at this kitschy monument at the side of the highway, the absurdity of writing several thousand words about it really struck me. The next “traditional” ritual, though, kind of gets me. Inlaid on each side of the border monument is a rock taken from the far end of each continent: on the Asian side, Cape Dezhnev on the Bering Strait, on the European side, Portugal’s Cape Roca. The ritual is to touch one side, touch the other, then stand astride the border, make a wish, and drink a shot of vodka (with the traditional Russian pickle chaser) so the wish would come true. And maybe it is the vodka, or the fact that the Germans were so damned good natured about it all, but I get a bit sentimental thinking of this vast continent that I am (sort of) in the middle of. It wasn’t all that long ago that I’d left Istanbul, but even just traveling along this thin border I’d covered a huge swath of Eurasian history, of interactions between Christians and Muslims, settlers and nomads, secularists and fundamentalists, democrats and despots, colonizers and the colonized, rival geopolitical blocs, people who believed themselves civilized and people the former thought uncivilized. Yes, it’s fruitless to map those distinctions onto East and West, or Europe and Asia. But it did seem to me that these particular 3,000-plus miles crossed a uniquely rich and complex part of the world. So maybe Europe and Asia don’t mean anything. But the border between them? Well, maybe it is something like a seam. I muse on this during the last leg of my trip, up through Russia’s nearly empty north. A few days later, I’m at my final border marker, an unpopulated train stop in the Russian Arctic called Polyarniy Ural. 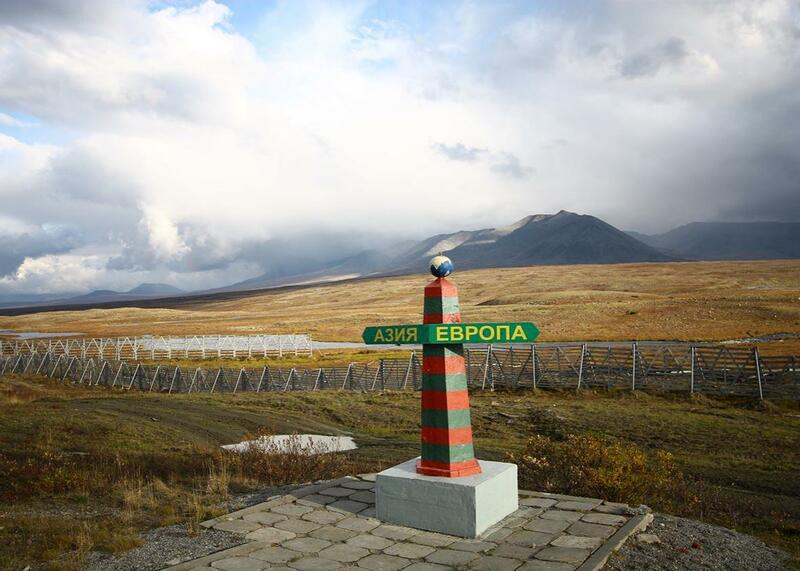 This is the northernmost Europe-Asia border marker, being the intersection of the Ural range with the northernmost East-West means of transportation, the train between two Russian Arctic outposts, Salekhard and Vorkuta. The marker itself is whimsically decorated in bright red and green stripes, a contrast to the stark tundra and mountains in the background. This is the traditional homeland of the Nenets people: animist reindeer herders who have more in common with Inuits or Greenlanders than with any classically “European” or “Asian” peoples. In Salekhard, I learn that the Nenets are concentrated in two main areas, one on each side of the Urals, so they call themselves the “European Nenets” and “Asian Nenets.” Imagine if the European Nenets were materialistic and rational, and the Asians traditional and inclined to despotism! But no, I’m told, it has nothing to do with that. And so Polyarniy Ural was an appropriately meaningless last stop on my tour of the Europe-Asia border, the last of so many border markers that clearly mark nothing at all. The stop was supposed to be 28 minutes, and the marker was a few hundred yards away; certainly there was time for a brisk walk there, a couple photos, and a brisk walk back. So I and a couple other guys on the train headed out. On our way back, with what should have been several minutes to spare, we heard the train stewardess shouting at us as she leaned out the door of the train, which was slowly moving away. We sprinted and made it; the conductor had decided to leave early. The stewardesses tut-tutted us. “What would you have done if you’d gotten stuck there?” It was a good question: It was cold, and totally empty except for the monument. But never mind. I was back on the train and headed into Europe.